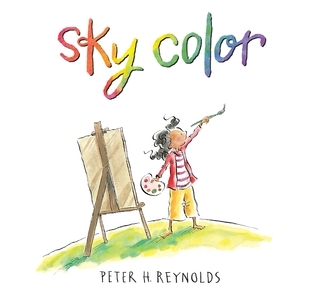 Sky Color is the third book in Peter Reynold's creatrilogy, which also includes The Dot and Ish. Marisol is a budding artist who lives and breathes for painting so when she is asked to help paint a mural in the library she is ecstatic. Marisol volunteers to paint the sky but is taken aback when she discovers there is no blue paint. A puzzled Marisol becomes more attuned to her surroundings and begins to notice nature's abundance of colors, tones, and hues. A reminder for everyone of all ages to pause and take note of the vast array of colors in our world and to embrace creativity and individuality.